We've all had a crazy childhood dream and mine was becoming an airline pilot. Many young people who aspire a flying career are unaware of the content of flight training and the preparations which are needed. On November 23rd, 2015 I started my ATPL(A) training. Time to realize my childhood dream. I'd like to take you along on an adventure and I'll happily answer all your questions on the way. Let's do this! May 8th, 2017 - Today I started the MCC/JOC with 5 fellow students, the very last part of my flight training. I've spent the past four weeks at home, but I continued to work hard because studying, flying and two observation flights were scheduled! When I passed my Instrument Rating Test on April 4th, I went back home as soon as possible. Hoping for some well-deserved rest, I found myself studying again after a few days at home. The end of the training is in sight, which means that the hunt for a job is getting closer as well. Therefore, I decided to take advantage of my free time and refresh my theoretical knowledge. Principles of Flight, Performance, Meteorology, Jet Engines and Air Law have already been dusted off. As soon as the MCC/JOC is over, the other subjects will be taken care of. Fortunately, studying the theory goes pretty smoothly. We can now link the theory to the operational knowledge we gained in Arizona and Oxford, which is undoubtedly a great help. Now it's just a matter of keeping up with the theory to make the interviews go as smooth as possible. I recently talked to one of my readers and was invited to spend a day flying with him. Giel flies every weekend with his father in a Beechcraft Bonanza G36 and this time I had the pleasure of joining him! We left from Kortrijk and flew to Ursel, a small airport in East Belgium. I haven't flown a lot in Belgium yet, so it was the perfect opportunity for me to explore the airspace a bit. In addition to that, it was simply a great day! It was great to go up again in a single-engine airplane. The Bonanza has 300 hp, is fully equipped for IFR flights and has retractable landing gear. Very different from the Piper Archer, but at least as much fun! The last part of the program has officially started! Today I went to school with 5 classmates for the introduction briefing of the MCC/JOC (Multi-Crew Co-Operation/Jet Orientation Course). We got a lot of explanation about the content of the program and received all the study material. During the first two weeks, we attend online classes, get briefings at school and do a lot of self-study. Before we can proceed to the practical section, we must first pass a theoretical test. Everyone is hugely motivated and on top of that, we have a great deal of fun flying the Boeing 737-800NG simulator. It promises to be a thrilling but interesting period! If everything goes according to plan, I will graduate on June 9th! The end of the training is coming closer. Soon, an update on the progress of the MCC/JOC will follow, as well as a report on the observation flights I participated in. Stay tuned! If you have any further questions about my training, feel free to leave a comment below. See you next week! Hello there! 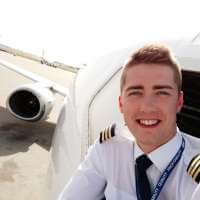 My name is Bob Geuens and I'm a 20-year old cargo pilot from Belgium. I'm currently flying the B737-400 for ASL Airlines Belgium, based in Liège (EBLG). Feel free to read all about my road to the right seat in the 'Series' section of the website. Happy landings and blue skies!